This MediaScene 1975 cover by Jim Steranko features his rendition of the movie poster for The Great Waldo Pepper, a film written by William Goldman and directed by George Roy Hill. The star, as you can see here, was Robert Redford! The movie, which is quite good, is about a pilot (Pepper) who missed out on the glory days of World War I. Margot Kidder and Bo Svenson co-star as his lover and rival. Steranko does a great job of portraying the film’s key elements for this cover, while leaving himself room for cover copy on the left. Steranko also did this illustration for the article on the movie production. 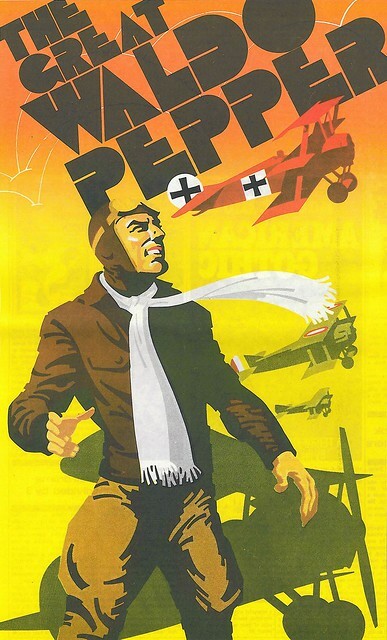 You can tell that he loves this period and he’s very good at drawing airplanes from this era. 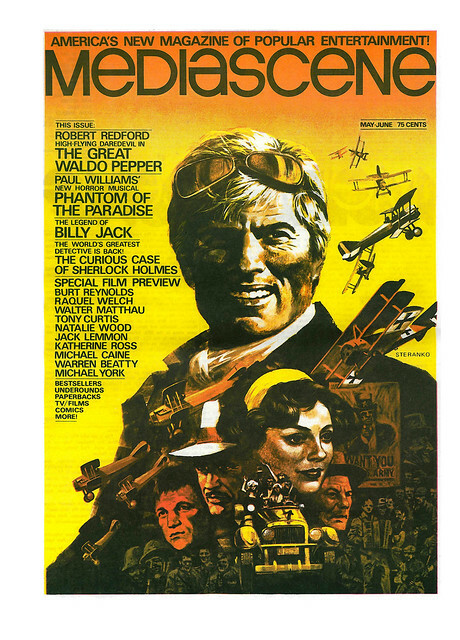 What I really liked about MediaScene was Steranko’s enthusiasm for movies, books, pulps, and art. He probably influenced my tastes more than any other person. I started reading Doc Savage, the Avenger, Science Fiction films, etc., as a result of this publication. Yet there was another influence as well, a love of history, pulps, and images from past eras. Wish I still had a complete collection of MediaScene magazines. Nuff Said!